Have you ever heard about medicine or spiritual healer ? Following the success of best seller book Eat Play Love by Elizabeth Gilbert ; spiritual healer become popular among tourist in Bali . Mostly those who experienced the spiritual healing feeling better emotionally and full of positive energy to be the better human being even heal them self . Positive energy brings positive attitude and life style to the patient . 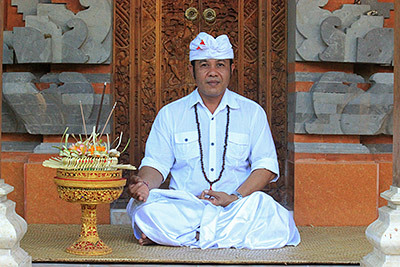 Spiritual healer has been existing among Balinese and become the part of Balinese tradition since BC . Spiritual healer is a person who dedicated him/herself to walk on the spiritual path and blessed by God with the spiritual ability to healing. “Made Lunas” is one of young respected Spiritual Healer , born and raised within the beautiful and serine traditional Kemenuh Village , he has been a Spiritual healer for over 15 years and now he has opened his house to non – residential of many different nationalities .